America invented the Western, and that’s only fitting — in many ways, the Western is about the way America invented itself. But our understanding of those origins — and the genre itself — has changed over the years. 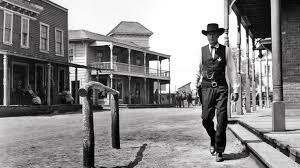 We’ll look at ways the movies have celebrated the West’s traditions and mourned their passing in examples from such films as High Noon, The Man Who Shot Liberty Valance and Unforgiven. STEPHEN WHITTY has been a writer and critic for the Star-Ledger, the New York Daily News, nj.com and Fortune.com, as well as a college lecturer, film festival host, interviewer and juror. Fee: $20.